We go on to joyously spend our way through the month of December until stores close on Christmas Eve — only to embark on the after-Christmas-sales surge on December 26. During the 2014 holiday season, U.S. consumers shelled out around $610 billion on retail purchases. This represents about 19 percent of the entire year’s retail sales (Source: U.S. Census Bureau, National Retail Federation). For 2015, holiday retail sales are expected to remain at similar stratospheric levels, with the notable difference of a larger-than-expected shift from brick-and-mortar shopping toward buying online. 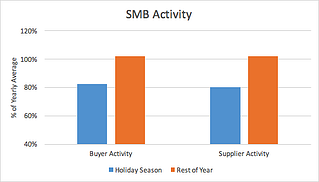 In fact, the holiday season actually has a slightly negative impact on SMB purchasing behavior. So how can this trend be explained? Why do many SMBs purchase on a different cycle than consumers? There are three main reasons. 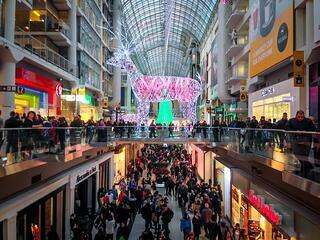 First, the consumer culture of holiday gift-giving is a primary driver of retail shopping. The absence of this behavior at any meaningful level for businesses means that they lack the same drivers to purchase during the holidays. Additionally, because B2B-focused suppliers are cognizant of this lack of holiday excitement for business purchasing, they in turn don’t give out as many “Black Friday,” “Cyber Monday” or “Holiday” deals. This lack of deals consequently yields less excitement among SMB buyers…and so on and so forth. Second, purchasing seasonality does exist for a lot of small businesses, but is often driven by events that impact business production or sales, like weather and harvest cycles versus public holidays. 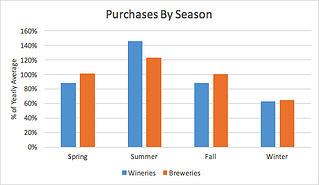 For example, equipment purchases among wineries and cideries are typically made in the months leading to the fruit harvest in late summer/early fall. Colleges and universities start purchasing auxiliary products for dorms and dining rooms after school lets out for the year. In mid-summer, breweries begin to stock up on specialty bottles or packaging to prepare for the now-ubiquitous pumpkin ale season. And finally, due to the consumer-facing nature of many SMBs (i.e., they sell to consumers), business purchasing habits are, in fact, driven by holiday shopping spikes - but with a phase shift. Many B2C companies experience, during the holiday rush, a massive spike in consumer demand for their products and services. So, their priority is to prepare for that spike in holiday-time demand, which often means preparing way in advance. For example, bars, restaurants and other retail stores that want themed promotional items and glassware in time to meet the holiday demand surge will need to begin planning those purchases weeks or months in advance. This has the effect of smoothing out small business purchasing across the latter half of the year instead of concentrating it during the last few weeks of the holiday season. A secondary impact of this surge in demand seen by consumer-facing SMBs during the holidays is that these businesses tend to prioritize catering to that demand over planning for long-term capacity increases. 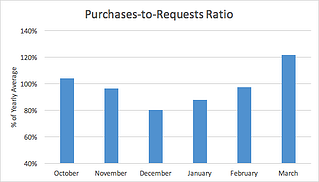 SMBs don’t drastically slow down their rate of research and requesting quotes for new purchases during the busy holiday season. However, they do delay their purchase decisions until after their busiest season is over. The unique nature of SMBs yields a very different approach to purchasing than consumers. Consumer holiday exuberance highlights the stark contrast between these groups. If you are a B2B company trying to cater to small businesses, taking the time to understand this different pattern of behavior will pay dividends. Learn how our service is helping small businesses grow. Subscribe to our blog to get the latest Kinnek news.